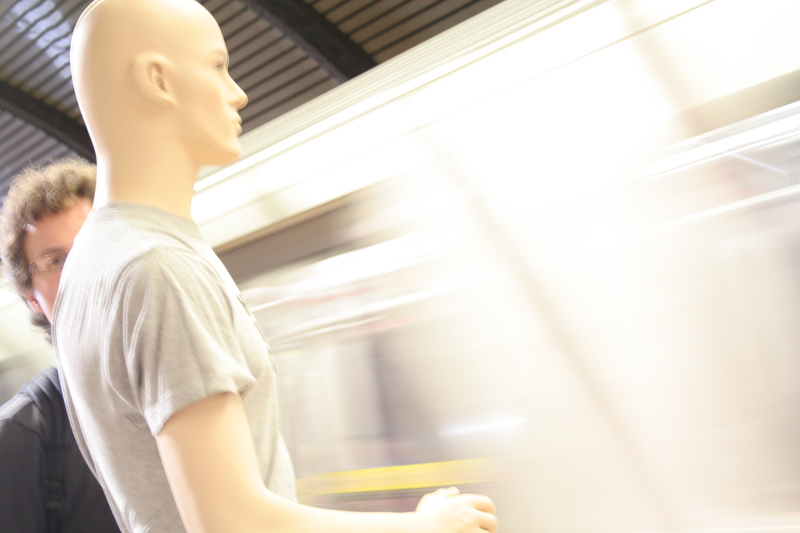 The mannequin made his way downtown on the subway. Nothing suspicious here; please move along. 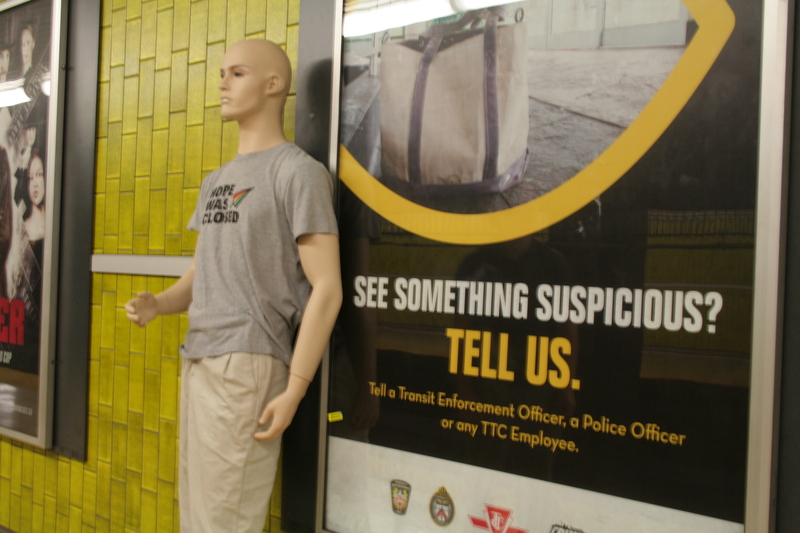 My trusty assistant and I set the mannequin up at Dundas Square, but security banished us to the South-West corner of Yonge and Dundas where the crazy conglomerate. If you’re not from Toronto, this is our famous soapbox corner, and it is overflowing with buskers, preachers and those with something unfathomable to proclaim. People stopped. People started (in fright) after realizing that the person they had noticed in their peripheral vision was in fact NOT a person. People read the sign. A couple people tried the QR Code, though not as many as expected. And we handed out flyers and talked to people. A lot of people were confused in ways I didn’t expect. 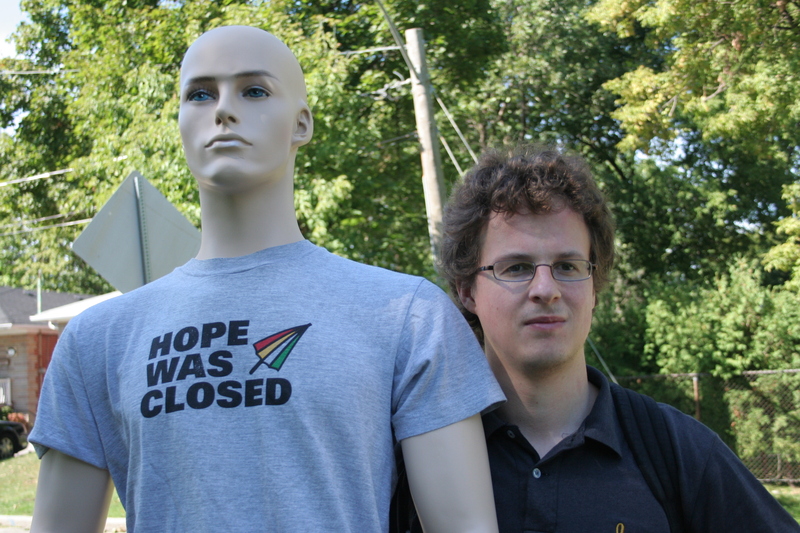 They asked “So is that you?” while pointing at the mannequin. One chatty, weathered-looking, older fellow told me about the history of Kuwait and asked if I knew the difference between a sociopath and a psychopath. His answer was that “a sociopath tries to hide it.” If you want to make someone uncomfortable, try this line at a cocktail party or conference with someone you only met moments ago. All told though, he was a harmless and interesting guy. He told me he had spent the summer wandering around at that intersection talking to people from all walks of life — new immigrants, the homeless, lingerie models — and taking their pictures. What I most enjoyed was the feeling that all of Toronto was streaming past — tourists from Asia, tourists from America, tourists from Europe and the Middle East, shoppers in summer clothes, bankers in black suits, Frosh in matching tshirts, professors, thugs, people on bicycles, mothers pushing strollers, fathers pushing strollers, people in wheelchairs, people on skateboards. Two squeegee kids swore profusely when their dog defecated on the sidewalk, but then produced a plastic bag from their bedraggled backpack and proceeded to stoop and scoop. 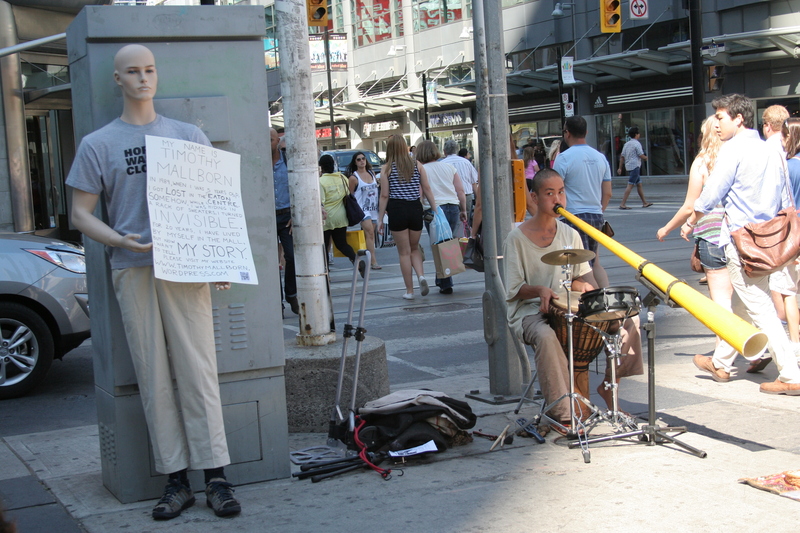 As the afternoon wore on, other buskers emerged from the subway station beneath our feet. A clown blowing balloons. Break dancers with a boombox. Spiderman. We shared our spot with a man playing the didgeridoo. From across the street came the clattering echoes of a festival of New Music — a peculiar droning and one piece which sounded exactly like a Formula 1 race — and above us the jets from the air show ripped by. There were cars and streetcars, people jabbering, phones ringing, kids laughing and kids crying. It was a muddy urban cacophony, a totality of sound. Once the didgeridoo player joined us on our corner, the passersby were doubly confused. It was really delightful watching them pointing out the mannequin to their friends, pointing at the musician and clearly, but inaudibly, confabulating about the relationship between the two. Many people concluded that they were the same act. 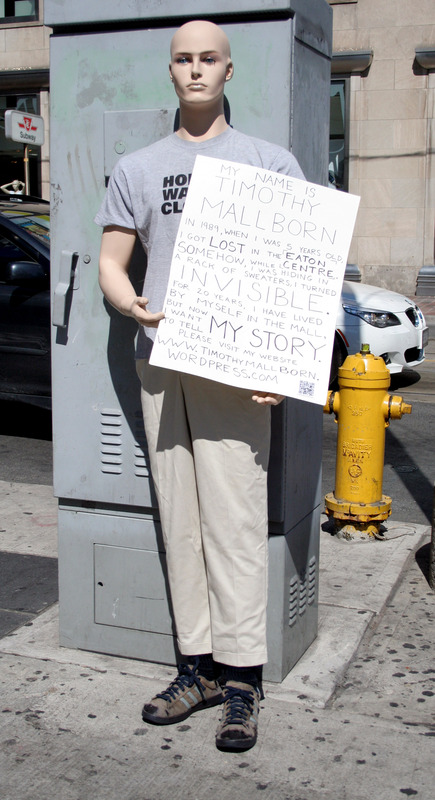 In fact, when I got home, I found a blog posting claiming that Timothy Mallborn was a “Great Street Music Performance.” If you follow the link, you can hear the didgeridoo player, who was indeed great, even though he wasn’t Timothy Mallborn. While I doubt I sold m(any) copies of the ebook, I had a fantastic day stirring the thick, chunky stew that is the corner of Yonge and Dundas. All photos taken by Myrtle Millares.